Morning Glory Muffins are one of my favorite muffins. Loaded with fruit and nuts, they have great texture and are hardier than your average muffin. But, like any standard muffin, they require a good amount of sugar and fat to keep that moist fluffy texture. I really wanted to recreate Morning Glory muffins because my kids love muffins (who doesn’t) and they are great as a grab-and-go breakfast and/or snack. In order to feel good about filling them up with these babies, I wanted to cut some of the sugar and saturated fat and add some whole wheat flour. This isn’t as easy as it sounds. Baking isn’t like savory cooking where you can add a pinch of this, a dash of that or use whatever you have on hand to craft the dish to your liking. It’s complicated and each “base” ingredient (sugar, fat, flour, salt, leavening agents) is part of a carefully orchestrated baking equation. Sugar keeps baked goods soft and moist, tender and fluffy. It also helps create that warm caramelized flavor and muffin top texture that makes baked goods so delicious. Fat does a lot of the same plus adds it’s own flavor and structure. Whole wheat flour is denser and can make baked goods dry and negatively affect the flavor. Needless to say, when you start messing around with the formula, you can really screw up your final product. BUT, I was determined. I’ve wanted to make my own version of the Morning Glory muffin for a while. And my success just-so-happened to occur during the height of pumpkin season so I figured why the heck not make ’em pumpkin?!?! And pumpkin puree is win-win because it adds so much flavor and nutrition AND can be used to replace fat. So, without further explanation, I present to you, Pumpkin Morning Glory muffins! Preheat oven to 375 degrees F. Line a standard 12-cup muffin pan with paper liners and spray with cooking spray. In a large bowl, whisk together flours, baking soda, salt, cinnamon and nutmeg. In a medium bowl, add pumpkin, eggs, sugar, apple sauce, vegetable oil, and vanilla. Whisk to combine. Pour flour mixture into wet mixture. Using a rubber spatula, fold wet ingredients into dry. Fill a standard ice cream scoop or 1/3 cup measuring cup, transfer batter to muffin tin. Bake for 20-22 minutes, or until a toothpick inserted in the middle comes out with a few crumbs. *Rotating halfway through baking will allow muffins to cook more evenly. Let the muffins cool in the pan for 5 minutes then transfer to a wire rack to allow them to cool completely. 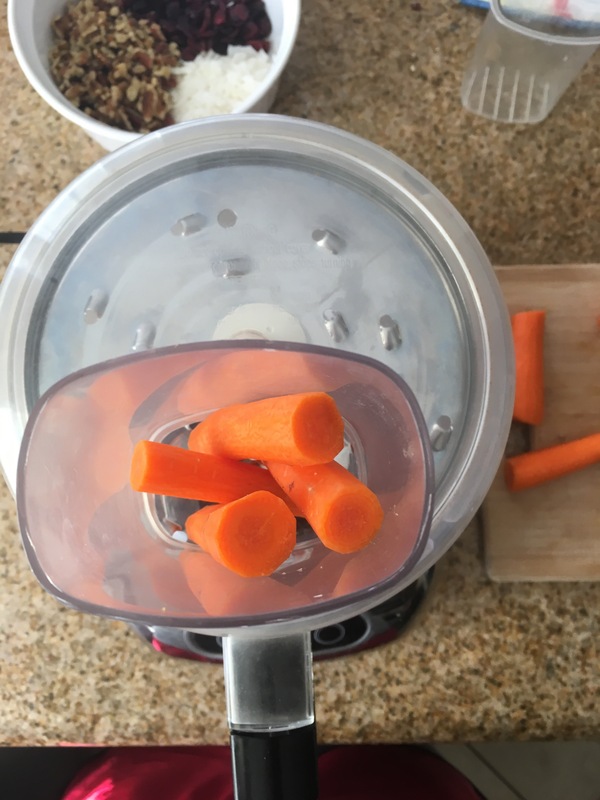 Use a food processor fitted with the grating plate to shred your carrots. Freshly grated carrots have a lot more moisture than the pre-shredded bagged varieties. Alternatively, you can use a box grater and grate them by hand. well i am not personally a pumpkin person but i am SO glad to see you back in my inbox!!! These look delicious, except for the coconut. I despise coconut! Can I just leave it out? Do I need to adjust the other ingredients if I do? Yes, you can leave it out. Try adding 1/2 cup chopped dried apples instead. Let me know how it turns out!! Could I substitute the apple sauce for shredded pineapple?